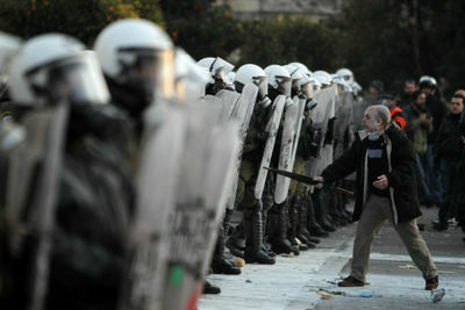 A protester gestures at riot police during clashes outside the Greek parliament in Athens. Tens of thousands of protesters gathered in the square outside Parliament as a parliamentary debate began, with more arriving constantly. As the crowds grew, a few hundred anarchists started to throw bottles and firebombs at police, who responded with tear gas and stun grenades.